Cookies 'n Cardio: Bananarama! Muffins and MORE! My favorite thing ever... the Kroger Bag o' Bananas! The recent trend on my kitchen counter is the overflowing amount of bananas that I seem to be accumulating. 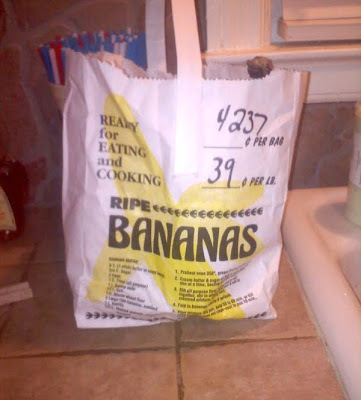 I'm sorry, but I just can't resist Kroger's cute little "Ready for Baking" discounted bag o' bananas, ya know... the ones that have lost all traces of green and perhaps are a bit brown in areas. I'm just saying... I like a nice mashed banana stirred into my morning bowl of oatmeal (topped with a blob of Better'n PB of course) or tossed into a blender for a tasty smoothie on a ridiculously hot Memphis afternoon. 1. Place in ziploc bag for 24 hours, throw it in your freezer. Then... toss them in a food processor. Pulse, scrape down the sides, pulse some more, scrape down the sides again... keep doing this until your frozen bananas look like frozen yogurt, or faux-gurt... I'm so clever. :) Delicious. Easy. Healthy. Give it a try. 2. Add a mashed banana to my stovetop oats. Check out my post with my go-to recipe for "Banana Oats." Topped with my fave Better'n PB... this is probably my favorite breakfast of all times. 3. Muffins! 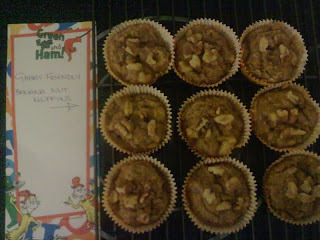 Banana muffins! Add dark chocolate chips, coconut, pecans, walnuts, dried fruit, chopped strawberries, or whateva other add ins that float your banana boat. 4. Be a smoothie king (or queen!) My personal fave is a "Green Monster Smoothie." Give that recipe a try and I promise you'll be hooked on these FABULOUSLY delicious and green monsterrific smoothies... and you'll never taste the hefty dose of iron and calcium that you'll be getting from the spinach! Oh and double that dose of calcium with the milk... sianara feeble bones! 5. Finally... training treats for Mr. Teddy! His intake of "people food" is very limited. I've gotta watch that puggy waistline! He is allowed to eat fresh fruits and veggies, with the exception of grapes or onions - they're poison for dogs y'all! 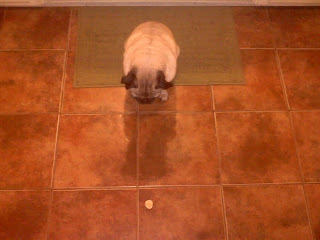 That's a slice of banana on the floor... Mr. Teddy doesn't even look at me as he sits patiently while I instruct him, "Wait... wait... wait... Ok!" As soon as I say "Ok" that pug moves faster than you would believe! 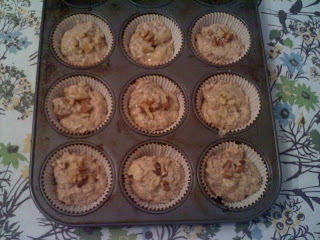 All that to say, banana muffins have been popping out of my oven faster than you can say Curious George. However, this girl can only eat so many banana muffins myself before I have to start worrying about the formation of my own "muffin top" above my jeans. Not cute. Luckily I have a fabulous roommate, who also has a love of cooking, baking, nutrition, and food in general, like moi! Side note - we met in our Principles of Food Preparation class at U of M. However... she is lactose intolerant. Which means if I wanna whip up a batch of cupcakes on whim, I have to be a bit more creative if I don't wanna wind up being the only one eligible to consume those little baked treats. In addition, I get to sample her old standby dairy-free recipes. Pretty sweet deal, right? Here's a recipe that I whipped up earlier this evening to make use of some of those bananas on my counter. - Preheat oven to 325 degrees F (165 degrees C). Line your muffin tin with some cute paper liners. - Blend together the eggs, milk, applesauce and bananas. - Sift together the sugar, flour, baking soda, vanilla, cinnamon, and salt. Add to banana mixture and stir in pecans. Mix well. 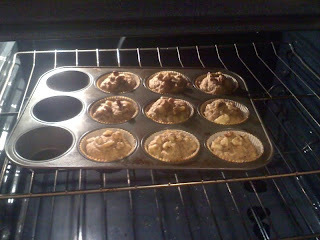 - Fill each liner about 2/3 full, place about four small pieces of walnuts on top of each unbaked muffin. - Bake for 18 - 22 minutes, or until a cake tester inserted in the center comes out clean. Yields:18 muffins*"Mock buttermilk" Take your liquid measuring cup and pour in 1 tsp lemon juice or white vinegar. Then add enough milk to fill to the 1/3 C. line (essentially you'll be using just under 1/3 C. of milk.) Let stand for 5 minutes... use as recipe directs. Into the oven they go..
... and out of the oven they come! I'm currently partaking in my fave Tuesday night tradition, Biggest Loser and painting my nails. This is how Mr. Teddy usually "places" himself on my lap. Thought yall might get a kick out of this. 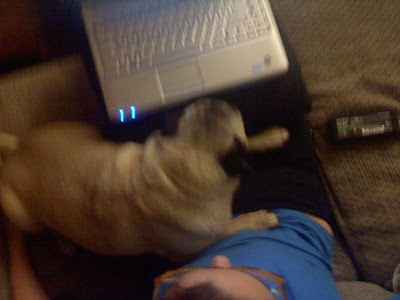 Apparently, just because you weight nearly 30 pounds doesn't mean you can't be a lap dog. I had no idea a dog would eat bananas! Very cool! Not sure if we ever let Onyx (my sister's dog) have one. He was most famous for eating mcdonald's hamburgers in one bite and spitting out two perfectly round, unpierced pickles. Guess he wasn't a fan. Ha! That's hilarious! Yep, Mr. Teddy eats just about any fruit or veggie. He LOVES melon of any kind. I mean, when he sees me take out the cutting board and an apple... he does not leave my side. Ha! Me, StrongME, and Better'n PB Giveaway! Pumpkin & Dark Chocolate? OK!